Important Dates: Submission deadline is Dec. 2, 2016 for Level 3, and Jan. 9, 2017 for Levels 1 and 2. Important Dates: The Poetry Contest is accepting submissions now through November 27, 2016. The Ten-Minute Play Contest will publish new application materials this fall; submissions for the 2016 contest closed in March. Important Dates: The 2017 contest opened on Sept. 15, 2016 and entries must be received by June 19, 2017. Winners are announced in January 2018. Important Dates: Submissions accepted September 1 – November 1 each year. Winners announced after April 15. Important Dates: Submission deadline is typically in May of each year, and winners are announced in the fall. About: The National YoungArts Foundation was founded in 1981 with a mission to identify and support the next generation of artists in the visual, design, literary, and performing arts.Thousands of students apply each year and winners attend weeklong programs offered in Los Angeles, New York, and Miami. At these programs, students participate in workshops with master artists. It is also the only path to nomination for the U.S. Presidential Scholars in the Arts. There is a $35 application fee, but fee waivers are available for students who qualify. Prizes: Regional Honorable Mentions are invited to participate in regional workshops. Finalists are invitedto participate in National YoungArts week where they have the opportunity to meet with the panel of judges and can win cash prizes up to $10,000. Finalists are also eligible for a U.S. Presidential Scholar in the Arts nomination. Important Dates: Submissions are due by mid-October for the following year’s programs. About: The Kenyon Review literary magazine of Kenyon College sponsors this writing contest aimed at encouraging and recognizing outstanding young poets. Last year, its eleventh year of competition, the contest received nearly 1000 entries. Who is Eligible: High school juniors and seniors in the fifty United States and the District of Columbia. Important Dates: Entries for the 2017 contest must be postmarked by April 14, 2017. Winners will be announced at the end of June. Important Dates: Entries must be submitted by March 15, 2017. Winners are announced in July. Important Dates: Submissions must be completed by February 5, 2017. Winners are announced in April. Important Dates: The 2017 contest deadline is January 4, 2017. On May 17 in Washington, D.C., the College Board and The Atlantic teamed up once again to recognize some of the best student writing in the world. As part of the Atlantic's Education Summit, the two organizations came together to laud the work of three extraordinary student writers who participated in the second Atlantic & College Board Writing Prize. Following up on last year's successful contest — where students were asked to write essays examining important documents in American history — this year's contest shifted the focus to significant works of art. Over 2,000 students from 43 countries submitted essays on more than 700 distinctive paintings, sculptures, and drawings. Some essays thoughtfully engaged with timeless masterworks from Van Goh and Di Vinci; others grappled with contemporary and unconventional work, such as the street paintings from graffiti artists like Banksy. This year's contest also incorporated a significant new element: revision. Revising is an essential and substantial step in the writing process; the judges wanted students to understand that revision is not simply proofreading, but that it is critical to good analytical writing. Or, as Sandra Riley, the College Board's vice president of communications, put it during her remarks, "Revision is an act of practice that helps writers truly become great." Contest semi-finalists were invited to participate in one-on-one editing sessions with members of the Atlantic’s editorial staff. After incorporating the editors' feedback, the three semi-finalists resubmitted revised essays for a final judging. As the overall winner of the contest, Nguyen received a $5,000 prize and his essay will be published in the September 2016 issue of The Atlantic. The other two finalists, Alejandra Canales and Rahul Malayappan, also produced strong essays that won considerable admiration from the judges. As finalists, Canales and Malayappan also received cash prizes of $2,500 each. To find out more about the students' editing sessions with the Atlantic editors, see this in-depth article from Poynter. In addition to being recognized at the summit, the finalists and their families were treated to a VIP tour of the nation's capitol before the day's festivities started. They began with a visit to the offices of The Atlantic where the students were able to meet face-to-face with the editors who provided feedback on their essays. 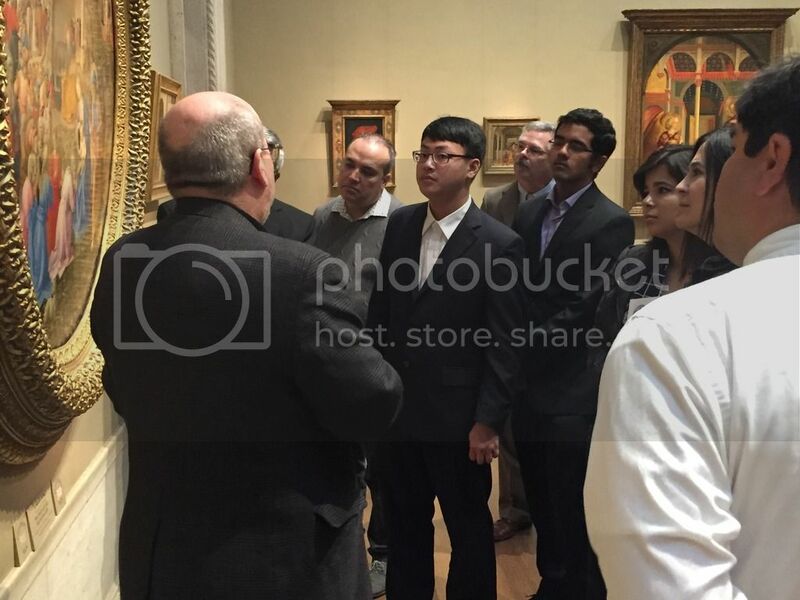 They then moved on to the National Gallery of Art where they received a curated tour led by one of the museum's senior lecturers. The students marveled at a Rembrandt self-portrait, and Fra Angelico and Fra Filippo Lippi's Adoration of the Magi, among many other works. The group then moved on to the National Museum of Women in the Arts for a viewing of the only Kahlo painting in D.C., the artist's Self-Portrait Dedicated to Leon Trotsky. The group ended the day with a dinner at the Old Ebbitt Grill and a tour of D.C. monuments led by the Atlantic staff.